Using electron microscopy and three-dimensional computer reconstruction, Berkeley Lab researchers have produced the most detailed ever image of a microtubule, a tube-shaped weave of proteins that help cells maintain their shape, transport materials, and divide. A microtubule, principal component of the cell's skeleton, at 8-angstrom resolution, obtained using cryoelectron microscopy and image reconstruction. This image will allow biophysicists to study the protein interactions that regulate a cell's life cycle. The 8-angstrom-resolution image opens the door for a better understanding of how certain proteins bind to microtubules and contribute to their stability or instability -- a fundamental component in the life cycle of a cell. Until now, researchers have imaged microtubules at a resolution of only about 20 angstroms (one angstrom equals one ten-billionth of a meter). Although this is an extremely close-up view, such images provide only a rough portrayal of how proteins bind with microtubules. Precisely where and how these bonds occur remained unclear. That's because the molecular interactions that regulate cellular function occur on a scale much smaller than 20 angstroms. For example, the average length of a protein bond is about 1.5 angstroms, and only at higher resolutions, such as at 8 angstroms, do these interactions begin to come into focus. "We'll be able to better see the secondary structure of the proteins that bind with microtubules, as well as the binding sites," says Kenneth Downing, a biophysicist with Berkeley Lab's Life Sciences Division who helped develop the 8-angstrom-resolution image. The fundamental building block of microtubules is a globular protein called tubulin, which joins in pairs to form a tubulin dimer. These building blocks stack head to tail to form protofilaments, which attach side to side like wooden slats in a barrel to form a microtubule. Because protofilaments are like compressed springs, these side-to-side bonds are under constant risk of shearing apart -- a phenomenon biophysicists suspect contributes to microtubule instability, and ultimately, disassembly. Tubulin, the building block of a microtubule: a ribbon diagram of the tubulin protein, based on a 3.7-angstrom-resolution model developed at Berkeley Lab. It shows a dimer consisting of two almost identical monomers. Equally intriguing are bonds formed by special proteins called microtubule-associated proteins, which attach to the exposed portions of protofilaments and somehow act as clamps, preventing the protofilaments from springing apart. Which force wins out in this constant struggle between stability and instability depends on where a cell is in its life cycle. During some stages, the microtubule-associated proteins stabilize the microtubule by holding fast to the protofilaments. But during cell division, these bonds weaken and the protofilaments separate. This triggers microtubule disassembly, which in turn allows the assembly of a new set of microtubules. To elucidate these interactions, Downing and colleagues have sought closer and closer views of microtubules. In 1998, they employed a multistep process to develop a 20-angstrom-resolution map. First, they used electron crystallography to image tubulin dimers at a resolution of 3.5 angstroms. 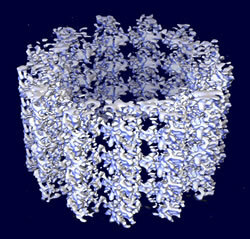 Separately, their collaborators at San Diego's Scripps Research Institute used cryoelectron microscopy and computer-based helical reconstruction to develop a 20-angstrom-resolution, three-dimensional framework of a microtubule. Finally, the Berkeley Lab team docked the tubulin crystals into this framework, creating a 20-angstrom-resolution image of how tubulin forms protofilaments, and how these form microtubules. It was a good start, revealing much about a microtubule's detailed architecture, but a 20-angstrom-resolution image is simply too coarse to depict the interactions between adjacent protofilaments. Downing's team needed to go below 10 angstroms. To get there, they abandoned helical reconstruction, which can't account for the minute distortions that stray from a microtubule's otherwise helical structure. Instead, they used a more precise electron microscopy technique called single-particle imaging. With this process, they treated the microtubule as an ensemble of discrete segments, rather than assuming the microtubule forms into a perfect shape as implied in helical reconstruction. In this manner, the Berkeley Lab team segmented microtubule microscopy images into sections big enough to properly orientate, but small enough so that each section didn't possess serious distortions. Data from 89 microtubule images, comprising 1200 segments and about 200,000 tubulin monomers, were combined to produce an 8-angstrom-resolution map. Finally, as in their earlier work, they nested tubulin images into this map. Only this time, because the resolution of the microtubule map was much higher than before, they were able to more precisely dock the tubulin. The result is a near-atomic-scale model. "At this resolution, we can see a tremendous amount of detail," Downing says. Such detail is already yielding dividends. For starters, tubulin dimers had never been closely studied as they naturally appear in a microtubule. They've only been studied in crystalline sheets of tubulin that form in the presence of zinc ions, a controlled setting necessary to produce electron-crystallography images. However, these crystalline images can only depict the interactions that link tubulin dimers head to tail to form protofilaments. The all-important lateral bonds, in which tubulin dimers in the protofilaments link side-to-side to form a microtubule, couldn't be closely analyzed. Now they can. "We'll get a much better picture of the critical interactions between protofilaments," Downing says. The 8-angstrom-resolution image could also shed light on how microtubule-associated proteins bind along the crests of a microtubule and contribute to its stability. 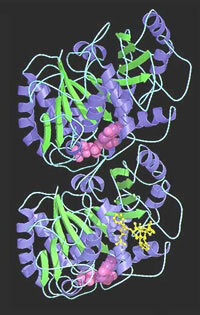 For example, one binding site, called the C-terminus, somehow promotes instability when it is unoccupied. This effect is neutralized when one of several different kinds of microtubule-associated proteins attach to the C-terminus and tie it down. "Understanding this process is one of the keys to understanding the biophysics of cells," Downing says. Other microtubule-associated proteins destabilize microtubules. These bind in a completely different manner than proteins that contribute to stability, and understanding their secrets is also high on biophysicists' wish list. There are also motor molecules, which bind to the spine of microtubules and somehow inch along, transporting materials throughout the cell. At 8 angstroms, researchers may be able to see the conformational changes that allow this movement. "We've opened the door for a lot other research," Downing says. "We need to use this image to explore how protein interactions regulate microtubules and affect the cell cycle." "Microtubule structure at 8 Å resolution," by Huilin Li, David DeRosier, William Nicholson, Eva Nogales, and Kenneth Downing, appeared in Structure, October, 2002, volume 10.